November 25, 2006 Nashville Predators vs Detroit Red Wings. 6-2 win. Karl Goehring was named WCHA Rookie of the Year in his first season of NCAA college hockey in 1997/1998. In 2000 he lead the University of North Dakota to a NCAA Championship. Goehring was named First Team All-Star and Firs Team All-Amerian. In 2000/01, his last year of college hockey, he wore the "C" as captain of North Dakota, an honour not usually bestowed upon goaltenders. May, 2001 the undrafted free agent was signed to a two-year entry-level contract by the Columbus Blue Jackets. Goehring spent four years in playing for Columbus' AHL team in Syracuse but was never called up to the big leagues. 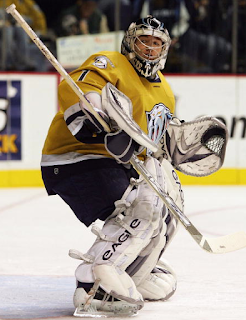 July, 2006 Goehring was offered a one-year contract by the Nashville Predators. 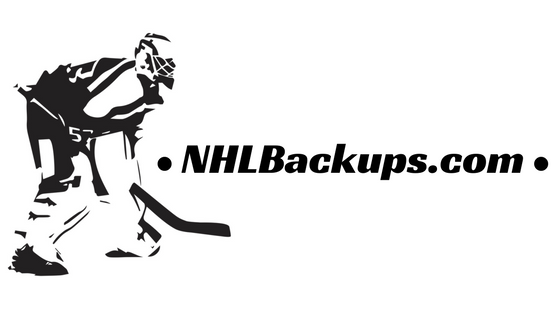 He was recalled for a single NHL game when Tomas Vokoun had to sit out with a thumb injury. Goehring dressed as backup to Chris Mason. Goehring retired as a player in 2009 and immediately stepped behind the bench. He served as an assistant coach with the 2009/10 AHL's Syracuse Crunch. Since 2010, Goehring has served as goalie coach of the University of North Dakota.